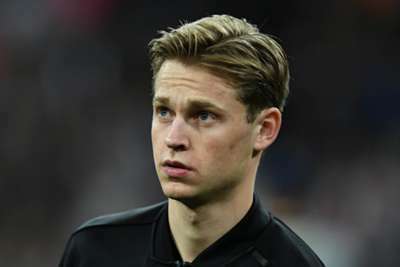 Frenkie de Jong has confirmed he asked Netherlands head coach Ronald Koeman for advice before agreeing to join Barcelona from Ajax. De Jong will link up with LaLiga leaders Barca for the 2019-20 season after agreeing a move worth a total €86million. Manchester City and Paris Saint-Germain were among the clubs reportedly interested in the midfielder, with Barca boss Ernesto Valverde critical of the Premier League champions after De Jong claimed Pep Guardiola called him to try to persuade him to move to England. But Barca got their man and De Jong has confirmed former Camp Nou star Koeman was a sounding board as he considered his future. "I've asked him a lot. I know that he's been successful over there," De Jong told reporters on Wednesday. "I wanted to know what it was like, how the city, daily life and the club were. It's always comforting to know those things before going there." Asked if he requested Koeman's advice, De Jong replied: "Yes, I did. Every time I joined up with the national team. "There's always been rumours of interest, so I wanted to know what Ronald Koeman thought of everything. "[He said] to go somewhere I get to play regularly. It didn't matter where, as long as I played. "I'm sure the manager has his preferences, but to him it's most important to gain experience at the highest level." De Jong is expected to play a key role as Netherlands open their qualifying campaign for Euro 2020 with home games against Belarus and Germany. Koeman has spoken highly of the player's attitude given he is still relatively young and inexperienced. "I don't think I was that wise when I was 21 years old," Koeman said. "I learned that later on in life. "He's that way in everything he does. He's always smiling. You'd want everybody to be like that, but unfortunately not everybody's the same." Of Netherlands' qualification chances, Koeman said: "If you're in the same group as Germany, you're the favourites to qualify for Euro 2020 together with them. But it also comes down to the points you take from the other teams in the group. And then, home matches should always be won. "The next game is always the most important. You never know what happens during that match that might impact the Germany game. The focus should be on Belarus: the better the result, the better the match, the better we go into the confrontation with Germany. "We need to win, and if possible in a good way, with good football, lots of chances and goals. But in the end, the most important part is getting the three points."